A Malaysian breeder based in one of Britain's holiday hotspots - Bournemouth no less - was the toast of Tattersalls last night when reaping 2,600,000gns for his yearling colt at the October Yearling Sale. The price topped the three-day Book 1, and meant Nick Ooi, who runs property and jewellery businesses in his native Malaysia, had gained a bumper result from his mare Penang Pearl. A winner of three races for Ooi and trainer Gerard Butler, the daughter of Bering was retained for the paddocks at the conclusion of her racing career, and produced several minor winners before a mating with Dansili produced a giant in the shape of Harbinger. Bought as a yearling by John Warren on behalf of the Highclere Racing Syndicate, Harbinger romped the Gr.1 King George VI & Queen Elizabeth Stakes and turned an ordinary mare into a precious jewel. John Magnier and Warren clearly felt she was no one-hit wonder, for yesterday they locked horns in a bid to secure her Galileo yearling and the price went into an unimagined orbit. Auctioneer Simon Kerins had to stoop to 5,000gns to get the youngster rolling, but from there it was up, up and away until Magnier - whose Coolmore Stud stands the sire - produced the defining offer. Ooi claimed to have bought the now 18-year-old Penang Pearl as a breeze-up horse, remembering the moment when saying: "I loved the way she walked - she was a little bit small, but she had a good pedigree... her grandam, Sauceboat, bred eight winners. "After she finished racing I started breeding from her, and went to Dansili because he is such a good-looking horse. When Harbinger did so well in 2010 I sent her back to Dansili the following year and bred a colt I still own called Penang Paparaja who is unraced, but in training with Michael Bell. The following year I thought this mare is so good I must go to Galileo." Ooi entrusted yesterday's sale to James Rowsell's Ashbrittle Stud, which bred last year's Gr.1 Oaks winner Talent. Assistant manager Ginny Whales, who is currently in charge at the Somerset farm, led the yearling around the ring and later admitted: "I wanted the ground to swallow me up when he started at 5,000gns, and when it stalled at 60,000gns I thought the boss was bound to sack me!" In fact Ooi was more than happy at that stage, and said: "I wanted to take him home because he is such a lovely mover - and better looking than Harbinger! I was happy at 5,000gns, and I was prepared to keep him up to 1,100,000gns, but after that I had to let him go." It lacked a block-busting individual price, but Tattersalls' October Sale Book 1 smashed records over the boundary during its three-day run which concluded yesterday evening. 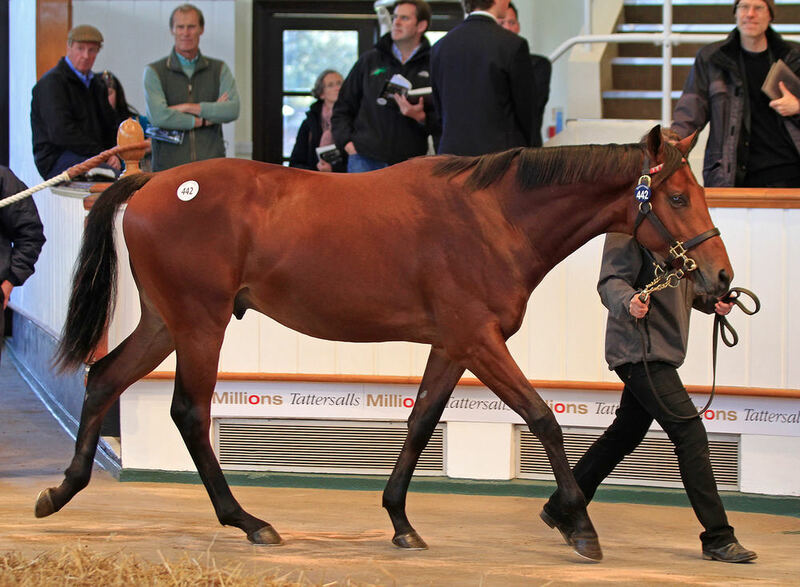 Turnover of 79,274,000gns, another record at a European bloodstock auction, was up 13%, having been bolstered by another thunderous round of buying by Sheikh Mohammed, who accounted for no less than 22% of the turnover through his purchase of 38 yearlings for 17,465,000gns - and that was only the horses signed for by John Ferguson, let alone other friends and acquaintances of the Maktoum family. The jaw-dropping level of activity during Thursday brought about a median of 190,000gns - up a staggering 58% on the same session last year - while overall the median settled at 150,000gns, a gain of 15%. Similarly, the final day average was up by 56% to 284,519gns with the overall sale average being 235,935gns, a rise of 14%. The average and median overall as well as for the third session were records. With 336 of the 414 lots offered changing hands, the sale's clearance rate was 81%. No fewer than six horses made a seven-figure sum, two more than the previous best dating back to 2007, while 38 made 500,000gns or more, which compares to 22 in each of the two most recent editions, and is an amazing leap in three years from the nine yearlings which attained that sum as recently as 2011. Since then racehorse owners from Qatar have embraced the racing world with real impact, and an astonishing group of European-based stallions have been a magnet for buyers from around the world, including the emerging China Horse Club.